The two paisley ones work (but especially the Pretty Paisley one)....but I really like the color scheme of the Eric Carle & Sprocket ones. I think I'm leaning toward either the Eric Carle or Sprocket for my Boggle board that will be on black paper. What do you think? My Boggle board will be black & the rest of the boards are all light blue. By the way... I saw tons of other cute borders there, too. Some super cute owls (almost made me want to change my theme!). You can check them out at Carson-Dellosa. 5.95 flat rate shipping on all online orders. I'm loving that!! New search feature that makes it easier to browse. They have 4,200 items & now you can browse by keyword, grade, age, subject, learning need, product type, & brand. You can create wishlists now, too! (I personally love wishlists-- helps me find an item later). And they added social sharing..so you can facebook, Pin, Tweet, and Google+ items. So-- which border(s) do you think I should get? I like the sprockets the best. I just saw the sprockets up in another classroom. It looks great (as long as you don't use it everywhere). Super cute! I like the sassy sprockets. Can't wait to see pictures! I think the Sassy Sprockets! Love the colors in it. Just found your blog... I like the pretty paisley. 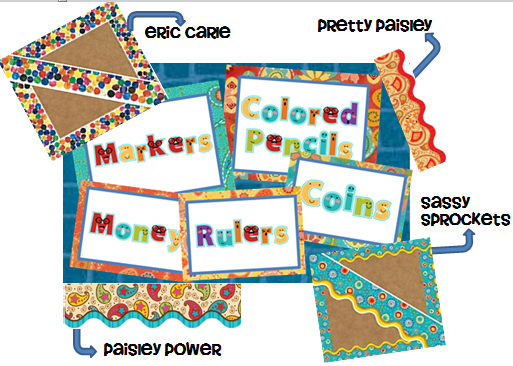 I love the pretty paisley myself! There is so much you can do with it.